Oh, I was a bit busy yesterday, so lots of previews…. today, might not be better… But it’s new comic day! Yay! The Beat – Unemployed superheroes hit Occupy Wall Street – I love this for so many reasons. It being a great comic that deserves so much more recognition is just the tip of the iceberg. CBLDF – Join a Webinar on Comics & Manga Censorship with CBLDF Executive Director Charles Brownstein – Support this organization! The Adventures of Unemployed Man is fun, funny and educational taking shots at today’s economic collapse and the issues people deal with day to day. It intelligently explains and teaches economic issues and satirizes the current economic and political state. This is humor as smart and biting as anything you’d find on The Daily Show or Colbert Report. MAIN STREET, USA-Against incredible odds, jobless crusader UNEMPLOYED MAN and his sidekick PLAN B embark on a heroic search for work-and quickly find themselves waging an epic battle against The Just Us League, a dastardly group of supervillains including THE HUMAN RESOURCE, TOXIC DEBT BLOB, PINK SLIP and THE INVISIBLE HAND. 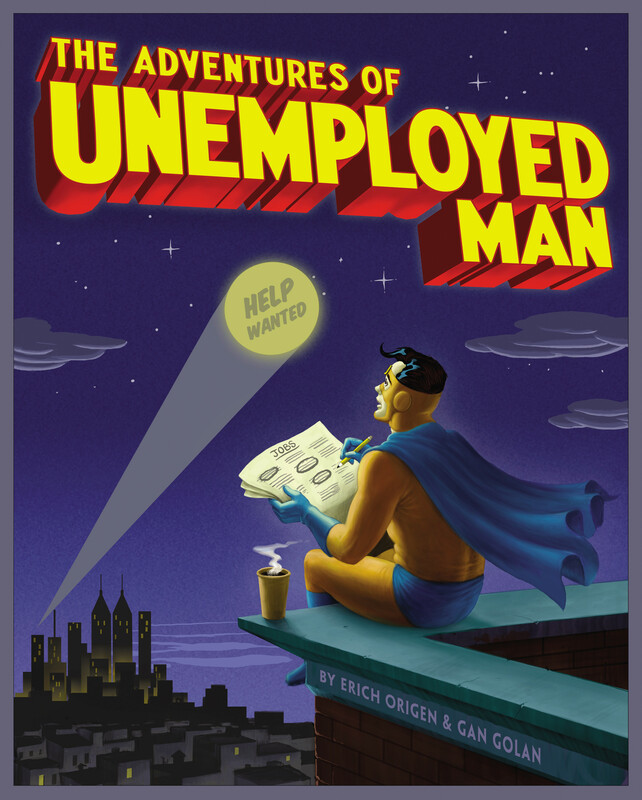 Experience this action-packed story in THE ADVENTURES OF UNEMPLOYED MAN-a fearless, brilliant, and provocative book that ASTOUNDS with incisive wit and AMAZES with stunning insights into the desperate situation so many heroes find themselves in today. A new supergroup of down-but-not-out heroes has emerged from the economic crisis, including perpetual grad student MASTER OF DEGREES, fix-it-with-tape DUCTO, pain-shrinking therapist GOOD GRIEF, checkbook unbalancer ZILCH, shadow worker FANTASMA, and WONDER MOTHER, who built her invisible jet from pieces of the glass ceiling. These heroes have enlisted the help of Erich Origen and Gan Golan, the dynamic duo behind the New York Times bestseller GOODNIGHT BUSH. Together they tell the story of our intrepid heroes’ climactic clash with the self-interested villains who dwell in the Hall of Just Us, devising sinister plots that threaten the entire world. This richly illustrated book is a parody of classic superhero comics from the Golden Age to the present day-and a brilliant dissection of our current economic meltdown. It features dazzling artwork by such comics legends as Ramona Fradon, Rick Veitch, Michael Netzer, Terry Beatty, Josef Rubenstein, Benton Jew, Thomas Yeates, Shawn Martinbrough, Clem Robins, Tom Orzechowski, Thomas Mauer and Lee Loughridge. Written by Erich Origen and Gan Golan with numerous artists, the story follows the fall and rise of Ultimatum and his eventual alter ego The Unemployed Man. The story is brilliant with perfect jabs at the various forces that exist and affect today’s economy. The best of all, it provides political commentary without shoving it all down your throat. There’s some minor issues in the graphic novel doesn’t go too deep into some of those economic forces to really explain what they are (Glass Steagall being the one that really sticks out), but this should be enough to get folks to want to find out what they are themselves. This is perfect satire that’s aimed at folks who let the rich get richer and don’t do anything about it. There’s educational materials that make you think, all wrapped up in entertainment. I wish all of politics was this much fun. This should be required reading for everyone to open their eyes and get them to really think about what’s happened the last 30 years to get us where we are. It’s a new month and we’re debuting a new feature that highlights articles from other websites. We can’t cover everything… yet. So, we’re seeing what other sites found interesting and covered in the last few days (usually 24 hours). It’s a whole new feature that we’re calling Around the Tubes. The Comics Chronicles – How were the comic book sales figures for January 2011? Check out the breakdown here. Death & Taxes – Andrew Belonsky checks out Unemployed Man, and how he can save the world. Mania – What are the 5 greatest comic book PSA’s? Find out here. A great slice of history. Screen Rant – Powers is heading to FX. ComicVine – Should super heroes follow civilian laws? We’re going with no, our government doesn’t! ICv2 – Upperdeck is launching a new trading card game based on Marvel comics. The Adventures of Unemployed Man created by Erich Origen and Gan Golan got some mainstream coverage courtesy of CNN.